K&N XStream® Top Universal Air Filters take performance to the next level with the addition of a filter within the filter's top adding more filter area for higher air flow and a longer service interval. The XStream® Air Filter provides awesome air flow and outstanding filtration. When racing, in any environment, racers need all the protection and airflow they can get. K&N delivers. All K&N universal air filters are constructed with ultra-strong molded pliable rubber flanges which absorb vibration and allow for secure attachment and can also be stretched for up to 1/16 inch. The optional adaptor ring allows the Filter element to be held in the groove at the end of the OE Air Filter Box. The Pumaspeed Workshop team are ready to fit the K&N X-Stream Air Filter and adaptor Ring - Mk3 RS 2.3 Ecoboost in our Head Office located here. Therefore making parts and labour a total cost £118.49 (inc. VAT). 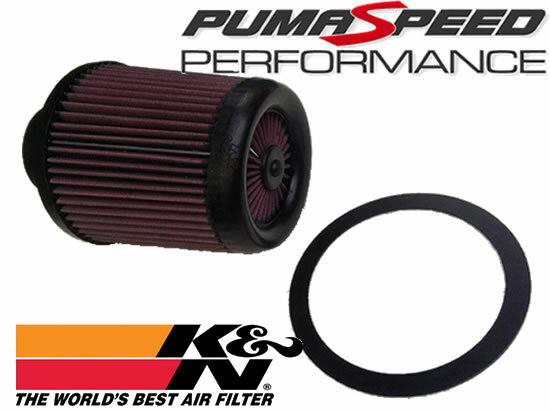 Pumaspeed have a specialist distribution team that can dispatch the K&N X-Stream Air Filter and adaptor Ring - Mk3 RS 2.3 Ecoboost to any destination worldwide.